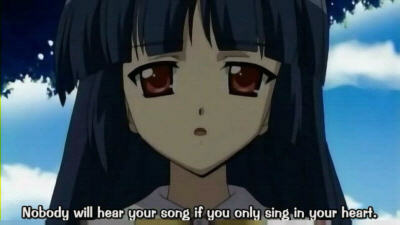 Pic of the day: "Nobody will hear your song if you only sing in your heart." How true. On the other hand, will they truly hear you if you don't? As you know by now, I lost NaNoWriMo as usual. It's OK, I don't get depressed from it, and my hand is less damaged than the last couple years at this time. Tsaiko won again, of course. Narrowly, of course, because she slacked toward the end, as usual. I guess we do repeat history. Those who don't learn from history are condemned to repeat it. And even if you learn from it, some of it can be fun to repeat. Around this time I read a quote from C.G. Jung about artists. He said that the artist has human plans and wishes too, but these do not really have anything to do with the artist part. The artist works for the collective subconscious, and cannot really control himself. He can in private matters, but not inside his art. I believe this to be true. These belong to the class of people that I sometimes call "minor incarnations" or "minor avatars". I don't mean that in a very religious sense, but just that they represent something greater than themselves. The artist in our society, I have said, is not all entirely different from the prophet of the past, or the shaman. There are hacks who are really good at writing or painting or sculpting or whatever, but they are not artists. They do not move the heart of mankind. And neither do I, with my fiction at least. I am not so sure about facts.